First place winner, books by small publishers from the Catholic Press Association. This best-selling book, at its core, is a psychology of human development. Joan Chittister, one of our leading inspirational writers, invites us to embrace and celebrate the deep bond between humans and animals. 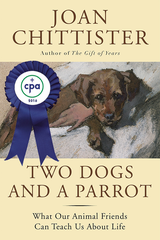 Two Dogs and a Parrot offers both heart-warming stories and thought-provoking reflections about sharing life with an animal companion. The relationships we form with animals—with dogs, cats, horses, birds, rabbits, and other pets—are full of joys and rewards. Our companion animals draw us out of ourselves and show us what it truly means to be alive. They teach us to accept life’s struggles and to cherish its pleasures and the importance of being able to accept ourselves and respect others. They help us to find purpose and meaning in what we do, and to overcome challenges and setbacks. In our treasured animals we observe varying degrees of excitement and play, of love and fear. And we realize their beautiful uniqueness, their sensitivities and strong sense of purpose. Whether we have an animal companion, long to have a pet or love someone who does, or cherish animals and nature, Two Dogs and a Parrot will speak to us all. It illuminates the significance of sharing our lives with a pet and celebrates the great gift of animals in our world. Here's your invitation: Sister Joan has created a special Two Dogs and a Parrot and wants you to post a picture of your pet (or you and your pet!) and tell us what your pet has taught you. Click here to see the gallery and share your picture and memory. Receive a free "Prayer for Animals" prayer card with each book. Order here! Click here.